It’s show business’ biggest night. It’s where the world recognizes the merits of the most talented artists and honors them with a golden idol. Typically, 40 million people tune in annually to this ritual. Most people get caught up in the glitz and glamour and don’t realize what it is they are actually participating in. The Academy awards was birthed shortly after the formation of the Academy of Motion Picture Arts and Sciences in 1927. The fledgling organization held a dinner in the Crystal Ballroom of the Biltmore Hotel in downtown Los Angeles to set out its goals. Among the topics discussed that night was how best to honor outstanding movie making achievements and thereby encourage excellence in all facets of motion picture production. The first banquet was held on May 16, 1929 in which they handed out the first statues. Officially they are named the Academy Award of Merit. The statuette has become the most recognized trophy in the world, known by its nickname, Oscar. What’s fascinating about the design of the statue is that it is an art deco version of the ancient Egyptian god Ptah  (pictured at the top right). In Egypt, there were two major gods in charge of PICTURE MAKING, CRAFTSMEN, AND ARTISTS. One of them was Ptah. The ancient scribes and sculptors who created the best sculptures and pictures of the temples were granted a statue of the god Ptah from the Pharaoh himself. This ritual would take place at the capital at MnNfr/Memphis in the HutKaPth/Temple of Ptah. Likewise Hollywood’s award ceremony was held in a temple (The Shrine Auditorium) from 1947-2000 where it is now currently held at the Kodak Theater. The term Oscar also dates back to the Egyptian god Osiris who ruled over the underworld in the constellation Orion. According to pyramid text, the Pharaoh’s soul would ascend into Orion to be reborn as a ?STAR? to live for an eternity, but there was a catch. The Pharaoh’s soul would have to transform into a spirit to reach Osiris. Once the spirit reached the Osiris, it was immortalized and remembered forever. I find it a fascinating parallel that a person has to become an ACTOR (transforming your spirit into another) to win an Oscar. These stars are then immortalized by placing their names in a stone star on the Hollywood walk of fame. What’s also interesting about Orion is that NASA has discovered it has a Star Nebula where they believe that stars are born . Ellen G. White wrote of Christ second coming in the direction of Orion. space in ORION, whence came the voice of God. So here we have an ancient religion looking to the belt of Orion, modern science believing that is a star nursery, and Christianity looking for Christ’s advent to come from the direction of Orion. Is it possible that the devil is deceiving the world with a shift in focus? Just like the Pharaoh was worshipped as a god who became a star, our modern culture has adopted this same practice by worshipping those who become stars. The Webster dictionary definition for worship is: extravagant respect or admiration for or devotion to an object of esteem. The Bible is very clear about whom deserves our worship. The devil has not changed his ways… only his tactics. What worked in the ancient world to get people to worship the stars has now taken a modern form but is still star worship. Even those in the industry are aware of this worship connection. For example, at the 2006 Emmy’s award (the Emmy’s is another similar award ceremony like the Oscars), Stephen Colbert and Jon Stewart were introducing the award for “Best Reality Show” when all of a sudden Stephen Colbert blurts out “kneel before your god Babylon…”  as if to joke about how people can now worship the “reality stars” just as the film actors are worshipped. When comedian Kathy Griffin won an Emmy award she states in her acceptance speech “This award is my god now” . Academy Awards Presiden Hawk Kock thanks the “Oscar gods” in an interview for having such great films to choose from . Don’t be seduced into watching the world’s worship ceremony this year. The only one who deserves our worship is the God of Heaven and Him alone. 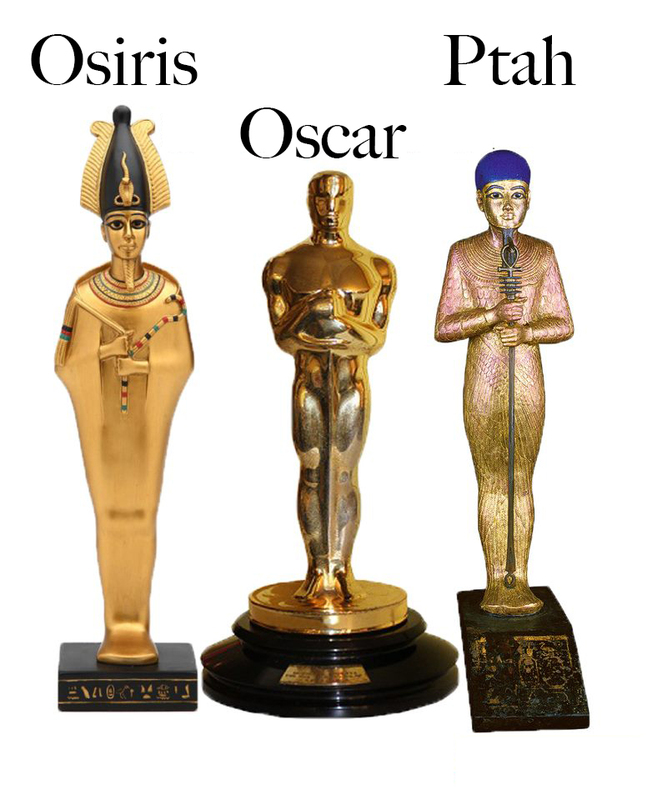 For more research, just type in “oscars” and “ptah” into google and read the articles yourself.